There are very few positives that stem from seeing Joel Embiid's name on a Sixers injury report. Philadelphia's best player, their safety valve, and their defensive anchor are removed from the mix all at once, forcing the team to search for a new identity on the fly. Side benefits emerge, however, when teams are forced to abandon Plan A in the regular season and take a look at more unorthodox options. The Sixers may not be able to develop the chemistry of their fully healthy starting five right now, but they can toy with a small-ball look that could be critical for them in a playoff series against the East's elite teams. 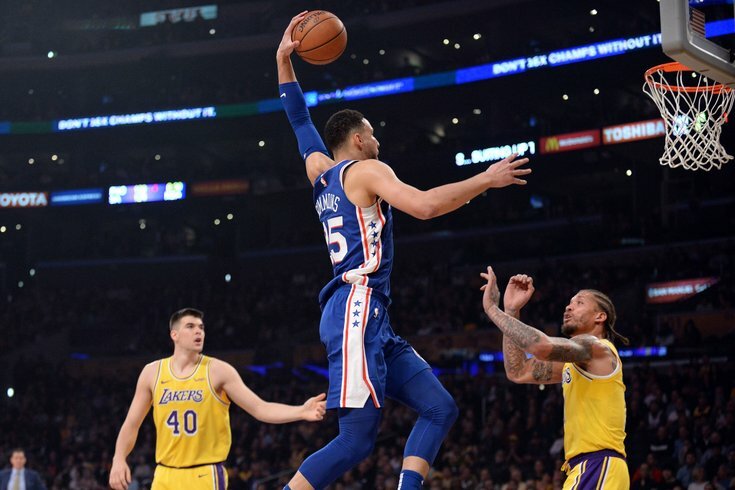 There have been demands from all corners of the internet to lean into Ben Simmons' versatility for some time now. Starting with last Thursday's game against the Heat, we began to see lineups we haven't seen much of since Jimmy Butler arrived on the scene. Using Mike Scott and Simmons as the "big" on the floor, Philadelphia downsized. The experiment continued against Portland last Saturday and New Orleans on Monday, with Brown turning to the group partially out of desperation. "Big ball didn't work, we really didn't fix much with Amir [Johnson playing], and so my instinct is when the game is clearly leaving us, that I'm going small. We're going to switch stuff, we're going to try to speed it up, hunt threes, that stuff," Brown said after Saturday's big loss against Portland. The question here is simple: is that a viable strategy for this group? The answer is more complicated, with the data and film providing fodder for both sides of the debate. Keep in mind, this is a limited sample that only equals out to about one full game's worth of possessions. But that data matches up with what you'd expect if you were simply looking at this as a mental exercise. When you can put a bunch of athletes on the floor and spread teams out, you can cause havoc on defense and punish mismatches. But without your defensive security blanket, you're susceptible to giving up easy baskets at the rim. "I think we have a better chance to keep the game in front of us by switching everything. There's a lot of like on like bodies out there, and I hope there's not as much needed at the rim. But in general, we miss [the rim protection]," Brown said after the Miami game last Thursday. "Trying to figure it out with that group was hard." Defending in a league where teams can now put four and sometimes five shooters on the floor at a time is a Herculean task. For Philadelphia, there's another layer of complication — integrating another set of new pieces before the playoffs start in mid-April, months after making another franchise-altering trade. Tobias Harris has had moments in Philadelphia where he leveraged his size and athleticism quite nicely on the defensive end. But right now, he's still adjusting to life in Philly, and when there's not a Joel Embiid sized barrier between an opponent and the rim, his mental lapses are a lot more glaring. Until a bench piece emerges from the post-deadline muck, the Sixers are also forced into fairly rigid lineups when they decide to go small. Simmons, Harris, and Butler are obvious inclusions, and beyond that, it's sort of a free for all. JJ Redick's shooting is invaluable, but he gets hunted on defense. T.J. McConnell is great in short spurts, but often problematic when paired with Simmons. Let's just say Jonathon Simmons and James Ennis haven't exactly solidified their rotation spots yet. And so the holdovers end up getting those minutes, which leads to predictable results when teams hunt Redick in mismatches. Combine these problems together, and you begin to wonder what the shelf life of this experiment is. This is a team that is already facing an uphill battle to build chemistry. Wrinkles and changeups are pivotal in the playoffs, but can they justify tinkering this late with the team still in need of forging a collective identity together? That answer seems like a firm yes when the strengths of this unit have a chance to shine through. Though Brown's justification for small ball is that the Sixers can switch with less consequence, what's notable above is where they don't switch. Redick fights to stay matched up with Josh Richardson, denying Miami an opportunity to throw the ball to Olynyk with Redick guarding him. The Sixers push (aka "ICE") the pick-and-roll, Butler tags Olynyk, Harris cheats toward the paint, and ultimately the Heat fail to generate any offense of note, leading to a fast break for Philly the other way. This style of defense, which relies on collective responsibility instead of hoping Embiid can clean it all up, can certainly succeed with the athletes Philly can put on the floor. It's just more crucial than ever for the off-action players (in this case Harris and Butler) to be alert and ready to rotate. That hasn't always been the case, and Simmons' commitment on defense must remain steadfast in order to keep this thing humming. There's also the matter of being able to hunt mismatches easier when you're not worrying about where to put a big man on the floor. Harris' defense may be spotty, but his ability to beat mismatches is unquestionable. While Philadelphia has not turned to these looks often, odds are the Sixers will need them at some point during the playoffs. Many of the East's best teams have slimmer, quicker looks as a core part of their identity. Guys like Boston's Al Horford and Toronto's Serge Ibaka are basically full-time centers in today's NBA after splitting frontcourt time early in their careers, and the Bucks have one of basketball's great Swiss army knives in Giannis Antetokonumpo, who Milwaukee can surround with shooting and athleticism at a moment's notice. The are two primary differences between those looks and small-ball lineups with Simmons or Mike Scott at center. The first and most important point: small-ball units on other contending teams in the East have all proven they can defend. With Antetokounmpo at center, for example, the Bucks give up just 104.3 points per 100 possessions, which puts them in the 92nd percentile of all five-man groups. Their offense is much less dynamic, but it still ends up a net win for Milwaukee. Philadelphia's lack of continuity is also worth considering from both sides of the argument. Yes, it means that the Sixers have to juggle priorities down the stretch and develop Plan A before worrying about their backup plan(s). But it also means that most of the data we have for these looks is outdated — the Sixers' most-played small-ball lineup featured Wilson Chandler, no longer with the team, and that group did defend well, with McConnell-Redick-Butler-Chandler-Simmons producing a +8.8 NETRTG in limited minutes. When Joel Embiid is on the floor, the Sixers have an identity. That is not necessarily the case without him, as Brown tinkers with pairings and lineups that have had very little time to gel. Boban Marjanovic has not proven in his career that he can keep up with things when teams spread the floor and run, and Jonah Bolden is still green around the gills, prone to fouling and overhelping while chasing blocked shots. And so with 21 games left to play, demanding more from this small-ball group is imperative for Philadelphia. They may have the most talented starting five in the East when healthy, but from the coach down through the players, they must learn how to adapt so they're prepared when moments of diversity hit. It will come with pain, but that may end up being a necessary evil.